Facebook open-sourced PyText, its natural language processing (NLP) framework recently in an attempt to bridge the gap between experimentation and large-scale deployment in the field of NLP. 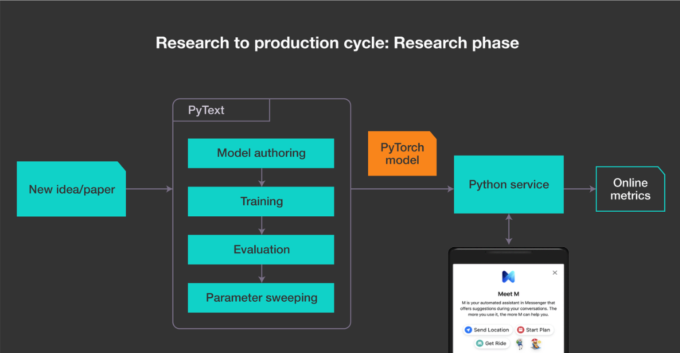 PyText is a library built on PyTorch, the company’s open source deep learning framework and the company believe that such a move will greatly help AI researchers and engineers to build a robust NLP system in a faster and more efficiently. Working on neural networks can often be challenging as it would require AI researchers and engineers to work with complex models that rely on multitask learning. The most common challenge that they face is something of “a trade-off between frameworks optimised for experimentation and those optimised for production,” says the company in a blog post. This they say is particularly common to NLP systems as it requires creating, training, and testing dozens of models. Though the existing research-oriented framework has a simpler interface that can speed up the creation of NLP system, Facebook says that they suffer from increased latency and memory use in production. While the framework for production makes it difficult to create dynamic representations of text sequences, considered to be a crucial element for creating a robust NLP system. Thus by providing a single unified framework from research to production, Facebook says that PyText can ensure simplified workflow for faster experimentation. Facebook has extensively relied on NLP for running various key factor in the social media platform. It has used NLP to deliver more relevant content to people, provide powerful accessibility features, flag policy-violating posts, perform translations among many. Here are of some of the key areas in which Facebook has deployed PyText to make their work more easier. Portal: PyText is used by Facebook in their video calling device Portal to handle calling queries in “Hey Portal” voice commands. The technology is used in Portal to understand the relationship between the caller and the person he or she is calling. M Suggestions: PyText is used in M suggestion on Facebook Messenger to run NLP models in real time in order to offer quick responses. DeepText: It is Facebook’s deep learning-based text understanding engine and PyText have been improving some of the features of DeepText. Conversational AI: Though it pulled the plug of one of its AI programmes when the platform started inventing its own language, Facebook might have not completely given up on the technology. In the post-Facebook says that it is using PyText in its conversational AI programme. PyText have been used in the project to ship new advancements more quickly to their conversational AI project. Vouching for the growth of NLP in the future, Facebook says that it will be working to make PyText more efficient and scalable. The company hopes to use the platform to support their multilingual modelling and other modelling capabilities in NLP.